Paper beads have been made since the Victorian era, when women would roll the beads using old wallpaper scraps to create curtains. Today we use them to make jewelry, or simply in decorations that we place around the house. These are a fun, simple craft to make with school aged children. The method I use below uses a paper glaze, however you could easily replace that with an Elmer’s Glue for safer use with children involved. This is my second post in the series of crafts created from recycled materials that we are doing for Earth Day. Please check out our tutorial on How to Make an Origami Kusudama Flower for another paper craft. Now, let’s get to making paper beads! Step 1: Cut your paper into a triangle shape using your paper cutter or scissors. 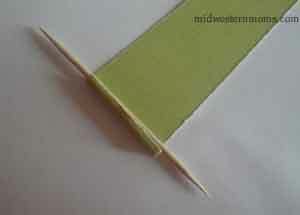 Step 2: Fold the widest end over a toothpick and begin rolling. When I start rolling I usually apply a small line of the glaze to strengthen the bead. Step 3: Continue rolling until you get to the very last 2-3 inches and apply a line of the glaze down the center. As you roll it, the glaze will spill out the edges, which is okay, because it will hold the end together better. Step 4: Using your brush, apply a layer of paper glaze over the entire bead to make it shiny and strong. Now continue to make the beads until you have enough to complete your project. Ideas: Paper beads can be made from any type of paper. Cut up your junk mail, magazines, old calendars – the purpose is to recycle your paper and turn trash into treasure! Cut the paper into other shapes to get different types of beads. Cutting a rectangle gets you a tube shaped bead. Experiment with the width and length of your beads. Note: Avoid getting the beads wet, as they will not hold up when submerged into water. These beads are sealed, but they are still paper and are not water friendly. Did you make something cool with your paper beads? I would love to see your creations, post your link here!